Cilliate undergoing cytokinesis, with the cleavage furrow being clearly visible. Cytokinesis is the process during cell division in which the cytoplasm of a single eukaryotic cell is divided to form two daughter cells. It usually initiates during the late stages of mitosis, and sometimes meiosis, splitting a mitotic cell in two, to ensure that chromosome number is maintained from one generation to the next. After cytokinesis two (daughter) cells will be formed that are exact copies of the (parent) original cell. It is formed after cytokinesis, each daughter cell is in the interphase portion of the cell cycle. In animal cells, one notable exception to the normal process of cytokinesis is oogenesis (the creation of an ovum in the ovarian follicle of the ovary), where the ovum takes almost all the cytoplasm and organelles, leaving very little for the resulting polar bodies, which then die. Another form of mitosis without cytokinesis occurs in the liver, yielding multinucleate cells. In plant cells, a dividing structure known as the cell plate forms within the centre of the cytoplasm and a new cell wall forms between the two daughter cells. 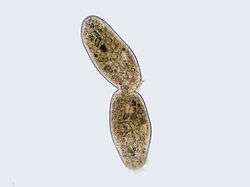 Cytokinesis is distinguished from the prokaryotic process of binary fission. Animal cell cytokinesis begins shortly after the onset of sister chromatid separation in the anaphase of mitosis. A contractile ring, made of non-muscle myosin II and actin filaments, assembles equatorially (in the middle of the cell) at the cell cortex (adjacent to the cell membrane). Myosin II uses the free energy released when ATP is hydrolysed to move along these actin filaments, constricting the cell membrane to form a cleavage furrow. Continued hydrolysis causes this cleavage furrow to ingress (move inwards), a striking process that is clearly visible through a light microscope. Ingression continues until a so-called midbody structure (composed of electron-dense, proteinaceous material) is formed and the process of abscission then physically cleaves this midbody into two. Abscission depends on septin filaments beneath the cleavage furrow, which provide a structural basis to ensure the completion of cytokinesis. After cytokinesis, non-kinetochore microtubules reorganize and disappear into a new cytoskeleton as the cell cycle returns to interphase (see also cell cycle). The position at which the contractile ring assembles is dictated by the mitotic spindle. This seems to depend upon the GTPase RhoA, which influences several downstream effectors (such as the protein kinases ROCK and citron) to promote myosin activation (by influencing the phosphorylation of Myosin regulatory light chain (rMLC)) and actin filament assembly (by regulating formin protein) at a particular region of the cell cortex. Simultaneous with contractile ring assembly during prophase, a microtubule based structure termed the central spindle (or spindle midzone) forms when non-kinetochore microtubule fibres are bundled between the spindle poles. A number of different species including H. sapiens, D. melanogaster and C. elegans require the central spindle in order to efficiently undergo cytokinesis, although the specific phenotype described when it is absent varies from one species to the next (for example, certain Drosophila cell types are incapable of forming a cleavage furrow without the central spindle, whereas in both C. elegans embryos and human tissue culture cells a cleavage furrow is observed to form and ingress, but then regress before cytokinesis is complete). Seemingly vital for the formation of the central spindle (and therefore efficient cytokinesis) is a heterotetrameric protein complex called centralspindlin. Along with associated factors (such as SPD-1 in C. elegans), centralspindlin plays a role in bundling microtubules to form the spindle midzone during anaphase. 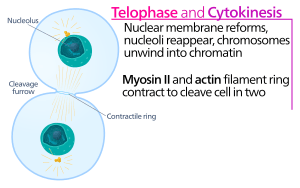 Cytokinesis must be temporally controlled to ensure that it occurs only after sister chromatids separate during the anaphase portion of normal proliferative cell divisions. To achieve this, many components of the cytokinesis machinery are highly regulated to ensure that they are able to perform a particular function at only a particular stage of the cell cycle. Cytokinesis happens only after APC binds with CDC20. This allows for the separation of chromosomes and myosin to work simultaneously. The phragmoplast is assembled from the remnants of the mitotic spindle, and serves as a track for the trafficking of vesicles to the phragmoplast midzone. These vesicles contain lipids, proteins and carbohydrates needed for the formation of a new cell boundary. Electron tomographic studies have identified the Golgi apparatus as the source of these vesicles, but other studies have suggested that they contain endocytosed material as well. These tubules then widen and fuse laterally with each other, eventually forming a planar, fenestrated sheet . As the cell plate matures, large amounts of membrane material are removed via clathrin-mediated endocytosis  Eventually, the edges of the cell plate fuse with the parental plasma membrane, often in an asymmetrical fashion, thus completing cytokinesis. The remaining fenestrae contain strands of endoplasmic reticulum passing through them, and are thought to be the precursors of plasmodesmata . The construction of the new cell wall begins within the lumen of the narrow tubules of the young cell plate. The order in which different cell wall components are deposited has been determined largely by immuno-electron microscopy. The first components to arrive are pectins, hemicelluloses, and arabinogalactan proteins carried by the secretory vesicles that fuse to form the cell plate. The next component to be added is callose, which is polymerized directly at the cell plate by callose synthases. As the cell plate continues to mature and fuses with the parental plasma membrane, the callose is slowly replaced with cellulose, the primary component of a mature cell wall . The middle lamella (a glue-like layer containing pectin) develops from the cell plate, serving to bind the cell walls of adjoining cells together. The word cytokinesis (/ˌsaɪtoʊkaɪˈniːsᵻs, -tə-, -kə-/) uses combining forms of cyto- + kine- + -sis, New Latin from Classical Latin and Ancient Greek, reflecting "cell" and kinesis ("motion, movement"). ↑ Glotzer M (2001). "Animal cell cytokinesis". Annual Review of Cell Biology. 17: 351–86. ↑ Otegui M., Staehelin L.A. (2000). "Cytokinesis in flowering plants: more than one way to divide a cell". Curr. Opin. Plant Biol. 3: 493–502. ↑ Cutler S.R., Ehrhardt D.W. (2002). "Polarized cytokinesis in vacuolate cells of Arabidopsis". Proc. Natl. Acad. Sci. USA. 99: 2812–2817. ↑ Charles E. Allen (July 1901). "On the Origin and Nature of the Middle Lamella". Botanical Gazette. 32 (1): 1–34. doi:10.1086/328131. JSTOR 2464904. ↑ "cytokinesis". Oxford Dictionaries. Oxford University Press. Retrieved 2016-01-21. ↑ "cytokinesis". Merriam-Webster Dictionary. Retrieved 2016-01-21. Nanninga N (June 2001). "Cytokinesis in Prokaryotes and Eukaryotes: Common Principles and Different Solutions". Microbiol. Mol. Biol. Rev. 65: 319–33. doi:10.1128/MMBR.65.2.319-333.2001. PMC 99029 . PMID 11381104.